Finally I have crunchy dill pickles. I have tried all kinds of recipes, and while I enjoy all the ones I've made, I love this one for their tangy, crunchy dill flavor! 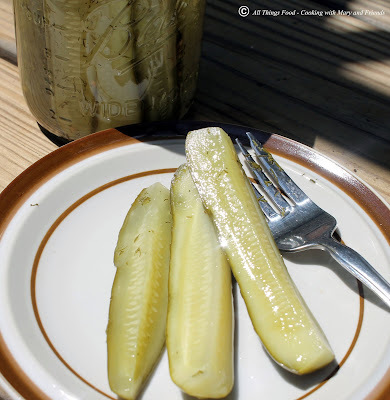 I've always wondered if salting was the key, and it certainly is, just as I discovered last year when I made my Old Fashioned Southern Squash Pickles. What a difference some time in salt water makes! You have to try it to believe it. Wash your cucumbers and thinly slice off the blossom end. (the blossoms have an enzyme that will make your pickles soft). Cut into spears or leave whole. Add 1/2 cup salt dissolved in 2 gallons water. Soak cucumbers in water for 12 hours, covering bowl with plastic wrap, and letting sit on your kitchen counter-top. Drain, but do not rinse. Combine vinegar, 1/2 cup salt, sugar, and 2 quarts of water. Place pickling spices in a cheesecloth, or in a mesh strainer that fits inside your pan below the surface of the liquid, and place in your vinegar brine. Heat to boiling. 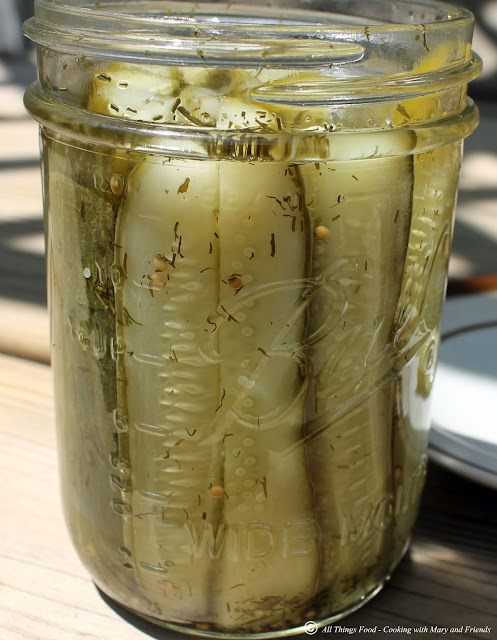 Fill pint/quart jars with drained cucumbers, packing tightly. Add 1 tsp mustard seed and 1 tsp dill weed or dill seed per pint (double for quarts). 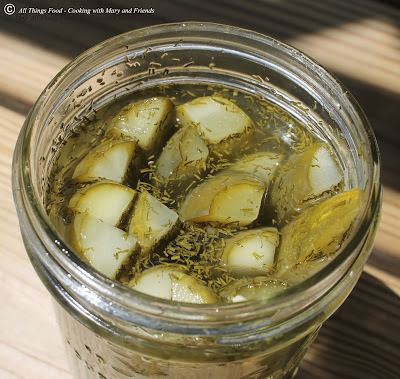 Fill jars with hot pickling brine (discarding pickling spice), leaving 1/2-inch head-space. Cover with lids and rings and process pints 10 minutes and quarts 15 minutes in boiling water bath or steam canner. Remove jars and let cool on a kitchen towel on your counter-top 24 hours. Store in pantry up to one year. Open jars must be refrigerated. Cook's note - If using a boiling water bath, bring water to almost a boil before adding jars so you don't add too much extra time waiting for water to boil. For optimum flavor, do not open for 4 weeks. Patience is key! Yield: approx. 9 pint jars or 4 quarts.